Description: Long black cockpit (measures 6" long, 1-7/8" wide, 2" tall). The top of the cockpit has a recessed seat. The back of the cockpit has a recessed circle with a curved lip on the top and bottom. The top lip has a raised round knob on top, and the bottom lip has a raised round knob on bottom. The center of the circle has a large odd-shaped hole with 2 small holes on the sides. The front of the cockpit has an upside-down U-shaped receiver hole. Description: Black rectangular cockpit seat with a ribbed backrest that is raised above the side edges of the cockpit. The seat area is recessed with molded controls and gears on the inside sides. There is a connector hole on the bottom of the cockpit, one on each side of the cockpit, and three on the front and back. Measures 3" long, 1-7/8" wide, 1-3/4" tall. Description: Square black cockpit seat with a slightly raised "backrest" on the top edge and molded gadgets and handles molded on the top edge of 2 sides. 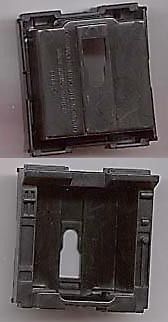 The "seat" is square inside with a connector hole in the center of the bottom. The bottom of the cockpit has an imprint marked "©1983 Fisher-Price Toys Division The Quaker Oats Co.". Measures 2" deep, 2" wide, 1-1/2" tall. Description: Square green cockpit seat with a slightly raised "backrest" on the top edge and molded gadgets and handles molded on the top edge of 2 sides. The "seat" is square inside with a connector hole in the center of the bottom. The bottom of the cockpit has an imprint marked "©1983 Fisher-Price Toys Division The Quaker Oats Co. Made in USA". (measures 2" deep, 2" wide, 1-1/2" tall). Description: Green (military green) rectangular cockpit seat with a ribbed backrest that is raised above the side edges of the cockpit. The seat area is recessed with molded controls and gears on the inside sides. There is a connector hole on the bottom of the cockpit, one on each side of the cockpit, and three on the front and back. Measures 3" long, 1-7/8" wide, 1-3/4" tall. 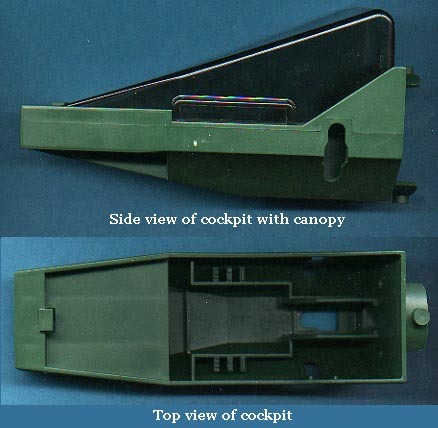 Description: Long green (military green) cockpit (measures 6" long, 1-7/8" wide, 2" tall). The top of the cockpit has a recessed seat. The back of the cockpit has a recessed circle with a curved lip on the top and bottom. The top lip has a raised round knob on top, and the bottom lip has a raised round knob on bottom. The center of the circle has a large odd-shaped hole with 2 small holes on the sides. 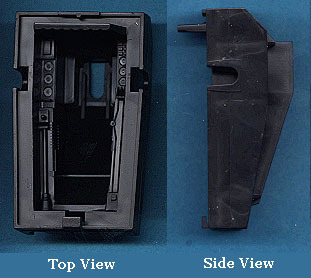 The front of the cockpit has an upside-down U-shaped receiver hole. Description: Grey rectangular cockpit seat with a ribbed backrest that is raised above the side edges of the cockpit. The seat area is recessed with molded controls and gears on the inside sides. There is a connector hole on the bottom of the cockpit, one on each side of the cockpit, and three on the front and back. Measures 3" long, 1-7/8" wide, 1-3/4" tall. Description: Silver rectangular cockpit seat with a ribbed seat. The seat has a high backrest and sides that angle down from the backrest. There is a connector hole on the bottom of the cockpit and on the front. 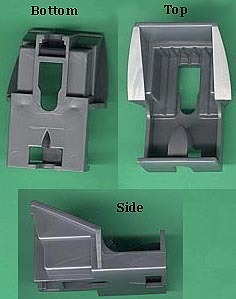 There is a divider in the front foot area to prevent feet from touching the connector hole area. Measures 2" long, 1-1/2" wide, 1-1/4" tall. Description: White rectangular cockpit seat with a ribbed backrest that is raised above the side edges of the cockpit. The seat area is recessed with molded controls and gears on the inside sides. There is a connector hole on the bottom of the cockpit, one on each side of the cockpit, and three on the front and back. Measures 3" long, 1-7/8" wide, 1-3/4" tall. Description: Long white cockpit (measures 6" long, 1-7/8" wide, 2" tall). The top of the cockpit has a recessed seat and a long nose with a black paper litho on top that has multi-colored control panels (the litho may be missing). The back of the cockpit has a recessed circle with a curved lip on the top and bottom. The top lip has a raised round knob on top, and the bottom lip has a raised round knob on bottom. The center of the circle has a large odd-shaped hole with 2 small holes on the sides. The front of the cockpit has an upside-down U-shaped receiver hole. The sides of the cockpit may have paper litho decals, such as a round litho with red, orange, and blue circular lines, or dark blue, white, and light blue striped across the side. Description: Yellow rectangular cockpit seat with a ribbed backrest that is raised above the side edges of the cockpit. The seat area is recessed with molded controls and gears on the inside sides. There is a connector hole on the bottom of the cockpit, one on each side of the cockpit, and three on the front and back. Measures 3" long, 1-7/8" wide, 1-3/4" tall.